We will once again be having a stall at this lovely event. 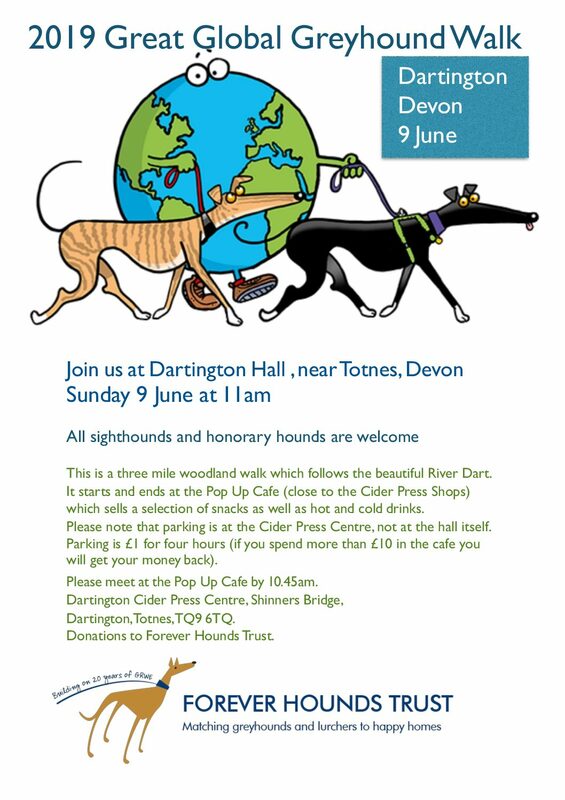 Do come and say hello to us and our ambassador hounds! Come along enjoy a walk and try and beat the record for greyhounds at this event. All breeds are very welcome. Join in for coffee and cake at the end! Forever Hounds Trust will be running the dog show at this lovely village event. Rosettes to 3rd place. All breeds welcome to compete in a variety of classes. We have a stall at this lovely village fayre again this year and we are looking forward to welcoming both humans and hounds. Please do come along and say hi – our wonderful dogs will be waiting for you! Once again we will be holding an All Breeds Fun Dog Show at this popular and well run event. Find us among the stalls and events at the Cricket Club Ground in Vicarage Lane. https://www.dog-fest.co.uk/ Come along and enjoy the day. This lovely event has become one of our favourite venues and we will once again be there with our hounds and our stall. Please do stop by to have a chat and meet our wonderful companions. Come and visit our stall at one of the best village carnivals around, this one is not to be missed. We and our wonderful hounds will be looking forward to meeting you so please stop by to say ‘Hi’. This is a Fun Dog Show and Animal Welfare Day. Fun for animal lovers of all types and well worth a day out. Please come along and support us, get to know more about greyhounds and lurchers and see why they make such wonderful pets. Come along to meet our wonderful hound and human volunteers for this collection and awareness event. We will be having a stand at this event, so come along and say hi!